I’ve been subscribing to Yoga Journal for years and still get a thrill flutter when I open my mailbox to find the new issue waiting for me. I usually begin flipping through the magazine as I’m walking back to my apartment or car not being able to restrain myself. In a recent issue, there was an article by Elizabeth Gilbert of “Eat, Pray, Love” fame in which she relates the experience of her very first yoga class. It’s a great read for those of you out there who do yoga. Remember your first yoga class? Well, for Gilbert, that first class began a love affair with yoga that continues to this day. I was particularly struck, though, by her revelation of how she burst into tears during that class. She was in the lying spinal twist when the instructor came over and opened up her body a bit more as she held the pose. That prompted a flow of tears and emotion helping Gilbert to release, as she puts it, the “longing, prayer, and doubt” she had held inside but never openly acknowledged. Crying during a yoga practice happens from time to time. We don’t realize how much “stuff” we hold in our bodies. I remember when a woman started to cry during a class I taught. Afterward, she came up to me and during our conversation she told me that her son had died during that past year and she was finding the yoga was helping her to release some of her pain. The cathartic release of painful emotions from your body allows for a transformation of sorts. You create more space for something else to come in. Gilbert called the “something else” shakti. I like to call it love. Love for whatever you can finally let go of. Love for whatever you feel is missing in your life. Love for who you are and where you are in this present moment of your life. Love for whatever may wait for you in the future. Just LOVE. So during your next practice, open up and feel the love that is all around you. I promise you will carry it with you off the mat. When thinking about what is real and what is not, you inevitably think about matter. After all, isn’t matter the substance of which our reality is made? And isn’t matter made up of atoms? Yes, and atoms are made up of energy. Therefore, it follows that matter is made up of energy. These days we are pretty comfortable with the explanation that everything in the universe, including ourselves, is made up of energy. (I’m using the term ‘energy’ in its broadest and all-inclusive sense. Let’s put aside for now the fact that there are different forms of energy). This is an idea that has been around for a while and it sounds scientific enough that we are comfortable with it. But I don’t think we have embraced the full implication of what this means. In science, the law of conservation of energy states that energy can neither be created nor destroyed. There is also the law of conservation of matter, which states the same thing. Einstein did us the favor of connecting matter and energy in his theory of relativity. So, if we believe that we are energy, then we must accept the notion that we cannot be destroyed. If the material world, matter, is a holographic manifestation of this energy, then our bodies are not real and will therefore die, but the energy – our true nature – will continue on. And if we are all made up of the same energy, then we are all connected. Not just to each other but also to the One Reality from which we were created. We can make some more connections here by seeing how religious traditions and philosophies translate the usage of the word “energy” in this instance to the word “spirit” or “Real Self,” while “One Reality” translates to “God” or the “Sacred,” or the “Divine” and “interconnectedness” becomes “non-duality”. The thread of non-duality connects all the religious traditions and spiritual philosophies around the world. Any apparent differences stem from doctrine, dogma (and their subjective interpretations) and external rituals. If the material world is illusion and non-duality or ‘oneness’ is real, then why not try to shift our attention away from the material and contemplate what is real – our oneness with each other and the Sacred? Think of the implications. There would be no more violence, physical or otherwise, because there would no more hate. Who would you hate? If we are all part of One Reality – then we are all the same. No differences, no separation. So what you do to someone else you do to yourself. Remember the Golden Rule? In the last post, I talked about how reality just might be an illusion because physicists are now suggesting that the material world is nothing more than a hologram, which would confirm what Eastern traditions have recognized all along, which is that “reality is an illusion.” There is also the suggestion of the interconnectedness of everything in our universe – that everything comes from the same ‘Source.’ Understanding that “we are all one” is becoming more and more obvious to us all, though the deeper implications of this statement still eludes us. Duality implies separateness – the idea that we are separate from everything and everyone. Non-duality, on the other hand, implies the opposite. Non-duality implies “Oneness.” So let’s see what can help us understand a deeper layer of reality. 1) In certain yogas, repeating, “Neti Neti “ translated as “Not this, not this” to everything we see helps us to recognize that the material is not real. These exercises serve a couple of purposes. They help the person understand that the physical world is not real, thus allowing him/her to transcend the material and come closer to understanding the Sacred, the Infinite Source, which created the illusion and is therefore the only thing that is real. Also, this exercise helps free the student of judgment. He/she does not form any opinion about anything. Everything just is. These are simple techniques that offer interesting insights. With the right intention, they are definitely worth giving a try. I don’t quite remember the first time I heard the statement, “Reality is an illusion.” It was probably back in the 80’s when I first got interested in yoga philosophy, but where I came across it I have no recollection. I do remember just glossing over these words not thinking about what they meant. A lot of what I was reading back then sounded very mysterious, and this idea that reality wasn’t real was no different. Fast forward 20 years and I am sitting in a room with a student taking the SAT. I was there to be a reader for him and one of the passages in the reading comprehension section talked about the movie Star Wars and its sci fi effects using holograms. The passage went on to say how science was beginning to gather evidence suggesting that the universe was nothing more than a hologram. I couldn’t wait to investigate this further. I went online and found a piece written by Michael Talbot, “Spirituality and Science: The Holographic Universe,” (based on his book, “The Holographic Universe”) discussing the breakthroughs of modern physicists David Bohm and Alain Aspect. Their work seemed to confirm what I had read in that SAT passage – that the universe is indeed a hologram. Two startling conclusions can be suggested if this is so. First, objective reality does not exist, since a hologram is not real. Reality, therefore, is an illusion. Second, it validates the interconnectedness of all things in the illusion. Let me explain the second part using an example from Talbot’s article. If you look at the hologram of any object, say a rose, you will see a 3 dimensional image of the rose. If you cut the hologram in half you will not get half the rose. You will find that each half contains the entire image of the rose. It doesn’t matter how many ‘pieces’ into which you cut the hologram. We don’t get pieces of the rose, only smaller wholes of the rose. This has led to a revision of the mechanistic model of the universe, where we only study the parts of things, to a more ‘wholistic’ way of thinking and seeing the world. We are finally seeing the forest instead of just the trees. The best example I can think of to demonstrate this paradigm shift is climate change. We are finally beginning to understand how by just focusing on the parts has been detrimental to the whole. In other words, we are beginning to understand that when you disturb one part of an ecosystem that can have consequences for that environment and possibly the entire planet. David Bohm believed this suggested that “separateness is an illusion” and that “all things are connected at a deeper level of reality.” A reality that is real. Pretty radical stuff, wouldn’t you say? To the western mind, yes, it is probably unbelievable. But the Eastern traditions have been saying the same thing for millennia. Remember the Star Trek series? In Star Trek: Voyager, the crew was able to entertain themselves on the holodeck. This was a place where various holographic worlds were created and story lines played out with the crewmembers acting out roles. While they were in the story, everything seemed perfectly real to them. But, of course, none of it was. Next time I’ll discuss some tools and techniques used to reach a more non-dual view of our world. Perception – Truth or Belief? I couldn’t wait until I was old enough to buy my own clothes. When I would go shopping with my mother, well, let’s just say our tastes weren’t entirely compatible. If she were alive today and picking out my clothes, I swear she would still buy the blouses with the peter pan collars. I remember back when I was a teenager and she would present me with yet another blouse with that horrid collar. “Oh mom,” I would groan, “they’re so childish.” “But, Diana,” she would reply, “they’re so pretty.” She thought they were sweet and feminine and I thought they were for six year olds. You could say it was just a matter of taste and leave it at that. But actually, it was a matter of perception. And perception is a powerful thing. So powerful in fact you could say that it is perception that drives not only our lives but also the material world. And the fuel is judgment. French writer Gustave Flaubert wrote, “There is no truth. There is only perception.” This is an accurate description of what we find when we concern ourselves only with worldly matters. It was perception that was the downfall of Flaubert’s most famous character, Madame Bovary. Emma Bovary perceived her life in a certain way and judged it as dull and empty. Married to a country doctor, she struggled to find romance and excitement through a series of adulterous affairs culminating in a ruinous life and her eventual suicide. Our perceptions become our reality, our truth as it were, but what reality or truth are we really talking about? There can be no certain validation of applied adjectives as truth. How we view our lives and the words we use to describe them is always subjective. Our perceptions shape who we are, how we appear to others, and how we experience our lives. And those perceptions not only contribute to the judgments we make, but they motivate our action in the world. For example, if hunger could not be perceived we wouldn’t eat, (well, maybe we would anyway but that’s another story). If the cold and wet weren’t judged as bad, we wouldn’t know enough to come in out of the rain. If we perceive ourselves as not having enough, we then make the judgment that we are poor and we try to find a better paying job. The ‘we’ I keep referring to, of course, is our ego, not the Real you or me, which is timeless, indestructible, and completely unaffected by the role our ego (or character) is playing on the world stage with all of its attendant ‘stuff’, i.e. the material objects that decorate its life. Remember, a basic premise of nonduality as proposed by Eastern traditions is “Reality is an illusion.” The ‘reality’ here refers the so-called ‘physical’ world and, of course, our perceptions of it. The lens through which we view the world is our mental conditioning, a compilation of every thought and experience we have gone through, which molds our perceptions (hence our beliefs) thereby preventing us from knowing the truth. It is the ego that buys into all the social agreements surrounding how we are supposed to live and the things we are supposed to have, i.e. the big house, the expensive car etc. More perceptions, more judgments, more struggle. These social agreements form our perceptions and therefore our beliefs, but is there any truth to any of it? Think of all the belief systems in the world and the measures some will take to defend them. We use these perceptions and judgments to drive our characters through the play on the world stage. That is their only function. They do not define who we are. So don’t worry about them. Just recognize the material as immaterial and move on. Truth is the only thing that has meaning. If we are searching for it in the material world we will not be able to find it because truth transcends the material. 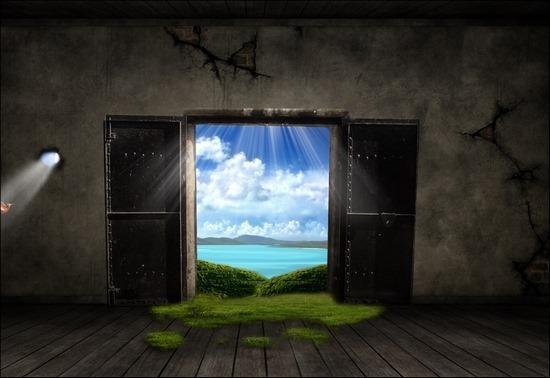 Poet William Blake said, “If the doors of perception were cleansed everything would appear as it is, infinite.” And that’s the truth. This is the launch of Nondualmind. I’ve always been a seeker and writing has always been a creative outlet for me, although it has usually been a monologue – up until now (I hope). To kick start this blog, let’s get to the ‘who, what, when, where, why and how’. Who – This is the part that’s all about me. I won’t waste your time here with that – go to the “about” tab and read on…. What – Discussion of the practical applications of spirituality in an attempt to better understand who we really are. Other topics like yoga, meditation, astrology will show up on occasion. When – No regular schedule, though I hope to post a few times a week. Why – The same reason you’re reading this right now – curiosity about the mysteries of life. How – Through dialogue. That is how, I hope, something useful will come out of this blog. I encourage constructive and respectful interaction. I want to hear what you think….